What's wrong with this picture? A 1959-D cent is supposed to have a Lincoln Memorial reverse. erhaps the most commonly asked question of any coin columnist is the value  or the definition  of "wheat-back" cents. 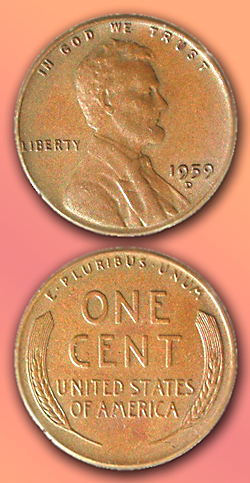 All Lincoln cents minted from 1909 to 1958 had two wheat stalks on the back, and thus are known as "wheat-back" cents or "wheaties." Beginning in 1959, the wheat stalks were replaced with the Lincoln Memorial building in Washington, D.C.
Generally, circulated wheat-back cents from 1940 to 1958 are worth about 2 cents each. Mixed rolls of 50 wheat-back cents generally retail for $1.50 and up. Earlier dates in the 1930s without a mint mark are worth about 5 cents each. Coins from the 1920s with no mint mark run about 10 cents and up; coins dated 1909 to 1919 run about 20 cents each in lower grades. Coins with mint marks  D or S  are worth more, and for some years, considerably more. The so-called "key" or "semi-key" dates include: 1909-S, 1909-S VDB, 1910-S, 1911-D, 1911-S, 1912-D, 1912-S, 1913-S, 1914-S, 1914-D, 1915-S, 1922-D, 1923-S, 1924-D, 1926-S, 1931-D, 1931-S, 1932-D, 1933 and 1933-D. The value of each coin varies widely with the actual condition (grade) of the coin. In mint condition with full red mint luster, most coins are worth 50 to 200 times their value in lower grades. There are also many scarce and expensive varieties in this series  too many to detail here. Any coin catalogue will illustrate that point. One unique  which means "one of a kind"  wheat-back cent surfaced a few years ago. In the early 1980s, a collector in the Oakland area found a 1959-D cent with the wheat-back reverse  instead of the Memorial reverse. After much publicity and exchanges among the collector, Heritage Rare Coins and two investors, the coin was sold at auction not long ago for more than $45,000. Remember, I said "one of a kind." Please do not write saying you found one (or more). When the story hit the National Examiner in 1992, I was flooded with bags of mail assuring me these writers had found one or more of these "unique" coins. No other such coin has turned up since the original discovery in 1982. Chances are better to win the state lottery than to find a second example of the famous 1959-D wheat-back cent. But no harm in looking.